Mexican boots are in reality cowboy or western boots. Some of them with a Mexican touch and style! Although there are many types of boots: wellington, high heel, riding, hiking, army and others, we focus on this page on a type of riding boots: the cowboy boots. Cowboy boots are part of the western wear fashion style developed today from the impressions of the Western US in the 1800's.... mainly the clothing and shoe-wear used by cowboys in Texas, Oklahoma and Kansas in that century. This style of clothing comes from the Vaqueros in old Mexico that in turn came from Spain. Cowboy fashion has a long tradition which is becoming increasingly popular across the US and it does not go out of fashion. There are basically two types of Cowboy / Mexican boots: western and roper. Roper boots are normally shorter than western, and have a round tip, and a lower heel; although these and other design features change so much depending on the designer. For example, the well known Lee Miller of Texas Traditions in Austin make some of the most exclusive boots for current customers with delivery time in months. On the other hand some of the best factory made quality boots sold in the US are made in Leon in the state of Guanajuato in central Mexico. Brand names such as: Caborca, Rio Grande, Arango, Cuatralba, Cuadra, and others. 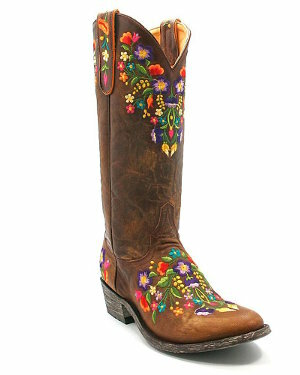 If you want a Mexican touch, here is an example of a typical western boot with a Mexican stitched design. The commercialization of cowboy western boots has created unique differences among manufactures and specialty makers. The fit is important and somewhat different than a regular shoe. Slippage is normal in a cowboy boot as it does not have laces. It gets a better feel after break in of the leather and sole. The big thing about Mexican style western fashion boots is the fact that most of them are not made by the traditional big name designers that have occupied our fashion world. In lieu, we find smaller specialty manufacturers hand-made by ordinary but talented people. They have obtained general public acceptance in the world of fashion. If you haven't tried a pair of Mexican or cowboy boots, you will find that they are always praised by people around you, and they make a perfect addition to your shoe collection.